Peer through the heavy gates outside the Rykestrasse Synagogue in Prenzlauer Berg and you could be forgiven for thinking that there is not much there, especially when it is compared to the ostentatious Moorish facade of the New Synagogue on Oranjenburgerstrasse in Mitte. 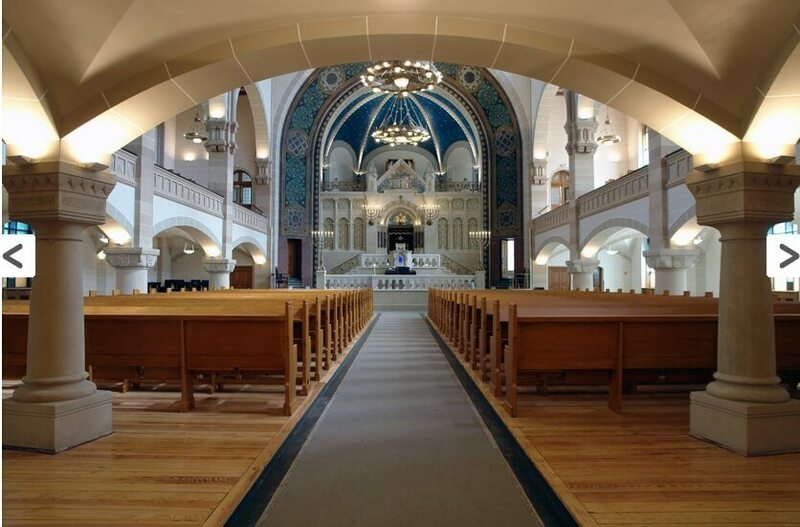 Yet step inside Rykestrasse’s synagogue and you will find yourself in a huge and splendid complex. For those who are used to humble places of worship of the sort that lived on in the little villages (or Shtetls) of eastern Europe, this neo-Romanesque building can be quite a shock with its stained glass windows, huge vaulted ceilings and fancy embellishments. For decades this was the main site of Jewish worship in East Berlin under communist rule after it was re-opened in 1953.A small community survived throughout the period in which the city was divided, though it has failed to thrive much now that the wall is down. It is, however, used for major events and recitals and is also probably one of the places most likely to have a seat on offer during the high holidays such as Yom Kippur (the day of atonement) and on Rosh Hashona (the Jewish new year). The building itself was built in 1904 and was damaged by the Nazis in 1938 during Kristallnacht, but it was not burnt down completely because the Nazi’s feared a fire would damage neighbouring apartments. It was fully restored and reopened in 2007. It is open for services on Saturday morning from 9:30 and it has an evening service on Friday night to welcome in the Sabath (Shabbat) at 6 pm in winter and 7 pm in summer.